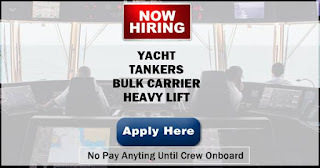 SEAMAN JOB INFO - Posted/Feb/2019 Michaelmar Phil, Inc. Available careers vacancy for Filipino seafarers crew join on YACHT, Tanker, Bulk Carrier, Heavy Lift Ships. MICHAELMAR PHILIPPINES INCORPORATED (MPI) was formed with the primary objective of recruiting and providing highly qualified Filipino seafarers of good moral character to recognized and reputable shipowners and third party ship managers. The Company was duly registered with the Securities and Exchange Commission under Registry No. A199719921 on 15 October 1997. MPI was granted its manning license by the Philippine Overseas Employment Administration (POEA) in 1998. The newest license of MPI is compliant with the MLC 2006 regulation, with license no. POEA–195–SB–053113–R–MLC. 0 Response to "AB, Oiler, Messman, Fitter, Electrician, Chief Officer, Chief Engineer (Philippines)"